Notice anything odd about the way Eva Grace is riding her bicycle? I think it would be odd for anyone else except Eva Grace! 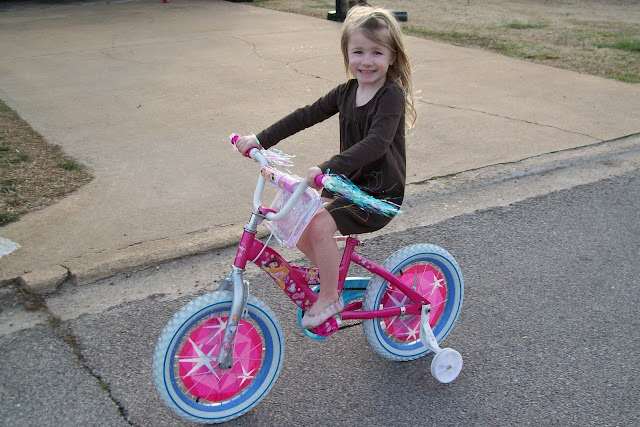 (her handlebars and front wheel are turned backwards). This is how she rode her bicycle until her neighbor friend pointed it out. Eva Grace still didn't know what the problem was! The other night we went to eat at Salsa's. When we were checking out there was a police officer (Keri Varner) standing behind us. 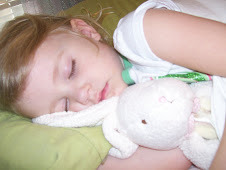 Eva Grace looked up at her for a few seconds smiling then proceeded to reach for her gun. The officer quickly slid her hand over the holster top! I looked at the officer in a little panic state and she calmly said, "Oh, she just wants to touch it." (This made me laugh inside!) Needless to say, we left immediately. Enough blogging, Eva Grace just informed me she is fixing breakfast for the entire family! I must check this out NOW! Did you know that Christmas is Jesus's birthday and Halloween is Joseph's birthday? Me either. But Eva Grace is sure of it. This stems back to VBS this summer with the Jesus, Joseph and the well/whale misunderstanding. Eva Grace still doesn't have that straight and now Joseph is right up there with Jesus in her eyes. I seriously don't know how to get through to her, I've tried for 5 months. Any suggestions???? Eva Grace wanted to go in the back yard to water the flowers. This is her uniform for doing such a task! 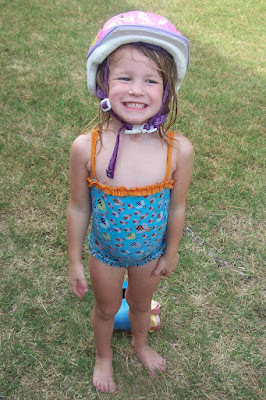 A bicycle helment and swimsuit, worn backwards, of course! Eva Grace's update on school today! a EvGrace is LOVING school! Here is her update from today! (I am typing as she is sitting in my lap dictating) You know who got to be the line leader - she did! Big deal, woo hoo! Very exciting! Lucy got to be the caboose- also a big deal. Sophie was behind Eva Grace - who was wearing a beautiful shirt and hairbow today. Carson was behind Sophie. She didn't have to bring her lunch box today because we don't bring our lunches on Wednesdays. Mrs. Kelly will color you happy if you behave and Mommy's will be happy. Mrs. Kelly will color you sad if you misbehave and the Mommy's will be sad at their honeys. Susannah wasn't there today because she went to Disney World! Wyatt couldn't sit criss cross applesauce so he sat with his knees up. In line Wyatt was behind Sophie and Carson was behind Wyatt. The class got to play with shaving cream on the tables and now her hands still smell like shaving cream. Mrs. Kelly said this would clean the tables like soap. Peyton was happy today but Xander was sad. They got to eat snacks in the cafeteria, which is a big deal too! Everyone got to help carry the snacks to the cafeteria but the girls had to watch Wyatt because he is little. They got to watch a movie today and Wyatt fell asleep. They woke him up with a horn. (?) A pink horn. I love school, picking Eva Grace up and hearing her stories (over and over and over) always brighten the day! **pictures from slideshow are courtesy of Eva Grace! 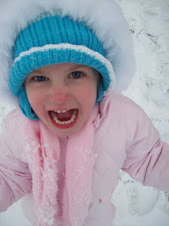 Since Emma has started back to school, Eva Grace asks 2 questions everyday. The first one is "Can I go to school today?" and the other is "Can we go pick up Emma." She is lost and bored without Emma here and she misses her friends. 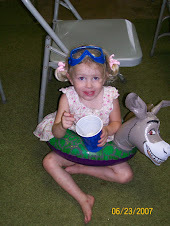 Last Thursday was a muchly awaited Open House for her school; we couldn't get there fast enough. She was so proud to meet her teacher and see where her new classroom was and what friends were going to be in her class. She went around taking pictures of all her friends (whether they liked it or not) the slideshow above is all her work! We are blessed to know almost everyone in her class this year (and their awesome parents). Eva Grace is saddened to not be in the same class with Lucy, Deanne, Emily and Abby but is excited about getting to play with them at recess. I have no doubt lots of blog entries will come from this school year, it will be fun, entertaining and interesting to see what this crew tries to pull off! The other day our cousin, Zeke, came to play for a little while. Zeke needed a diaper change so I changed it. Remember that none of my girls have ever been around any little boys and diapering, bathing, dressing, ... So, I'm changing his diaper and Eva Grace notices something different and the questions begin. "Mommy, what is that?" "Will it turn black?" "Will it fall off like Ella's did?" Daddy, how do you do that? We knew we would eventually face this situation, we just thought it would be with Emma first but we were wrong. Tonight Eva Grace was in our bed watching a movie. The way our newly positioned bed is you can see our bedroom bathroom from our bed. Burt forgot this and went to use the bathroom. As Eva Grace figured out what he was doing (peeing standing up) she curiously yells to Burt, "Daddy, how do you do that?" Burt, realizing she can see him, responds, "practice and magic." That answer was sufficient for now but I'm sure I will have related stories to share as soon as she decides to "practice" or tells Emma what Daddy was doing. Today we went to Hornersville, Missouri because the girls have been wanting to pick some watermelons and cantaloupes. Burt's Grandpa used to let him drive on the old gravel roads when he was little so he thought he would let the girls give it a try. Afterwards, he made the comment that one day Eva Grace is going to cost him a lot of cars! My girls haven't ridden on many gravel roads so on the way home this conversation took place. Eva Grace: "Daddy, the dirt is chasing us." Burt: "I just turned the rockets on, Grace." Eva Grace: "Well turn them on faster because it is right behind us." I love freckles on little girls. Emma has had them for a few years and we always awe over them. We call them angel kisses and she still thinks that an angel kissed her and made each freckle. Well, the other day I noticed that there are some adorable new little angel kisses on Eva Grace's face. We made a big deal about this so she would feel special and she is very proud of them. I should have known that angel kisses wouldn't be enough for her! This morning while getting ready for church she informed me that each of her angel kisses were a symbol of a super power. "This one allows me to kill dragons. This one allows me to kill tigers, and this one allows me to kill the big bad wolfs." She also informed me that she needs another one because she still needs the power to get back home after accomplishing these major tasks! IF you didn't read the previous story about Jesus and Joseph, this is a follow up story - so make sure you read that one first. We thought after several attempts to correct Eva Grace's view of the story of Joseph that she would surely have it. Me: Who did you learn about at Bible School? ME: What happened to Jochef... JOseph? EG: His brothers put him in the well? ME: Was it a "WELL" or a "WHALE?" ME: Good! Did Joseph get out of the well? EG: No, the well shut his mouth and Jochef couldn't get out of the teeth! ME: Eva Grace, a WELL DOESN'T HAVE TEETH! A WHALE HAS TEETH! EG: UHH HUH, a Joseph was stuck in the well.